We’ve identified the best affordable motion lights available—and we didn’t forget about important features like smart tech, weatherproof designs, and reliability. The RAB Super Stealth is one of the sturdiest motion-activated lights available. This industrial-grade motion lighting system offers a 60-foot detection area, and the motion detector senses 180 degrees side-to-side and 360 degrees up and down. 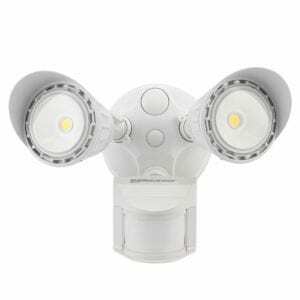 This outdoor motion sensor light is powerful enough to protect big areas, plus the dual heads can be adjusted to cover two areas at once. One of our favorite features is how durable this motion-activated light is. It has sturdy construction and is equipped with extreme temperature compensation. That means the RAB Super Stealth automatically adjusts its sensitivity for extreme hot or cold temperatures—so you get consistent motion detection in every season. If you’re looking for a strong motion-sensing light, the RAB Super Stealth delivers. It can handle bulbs up to 1,000 watts. Depending on how you arrange the lights, this dual bulb sensor can monitor up to 360 degrees vertically. 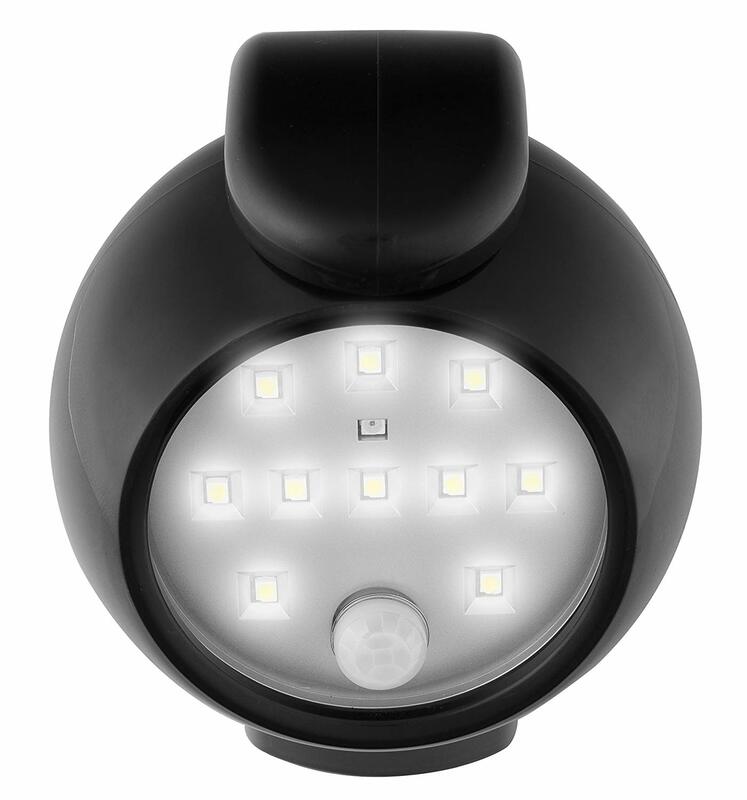 Multiple heads and sensors give this light greater detection range. And if you point the heads in different directions, you can monitor multiple areas at the same time. The RAB Super Stealth is a big light, so it’s not a great choice if you want small or discreet sensors. You’ll also have to hook up this light to your electrical system, so installation can be tricky. You’ll need to be handy with a drill to get this light installed. The RAB must be wired into a hardline, and its mount must be securely fastened to a sturdy surface. This is the most expensive light on our list, but we think the dual heads and illumination power are worth it. A single unit runs about $90, so this motion-sensing light is for people ready to make a serious outdoor security investment. This motion-activated security spotlight packs a powerful punch that won’t bust your budget. Whether you’re looking to enhance home security or add extra safety to dark entryways, this light fits just about anywhere. 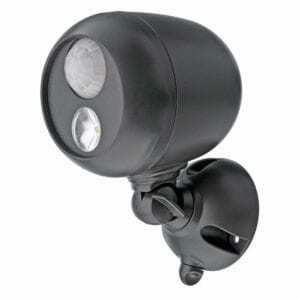 Even though it may be small, the Mr Beams Wireless LED Spotlight provides up to 140 lumens of bright LED light. 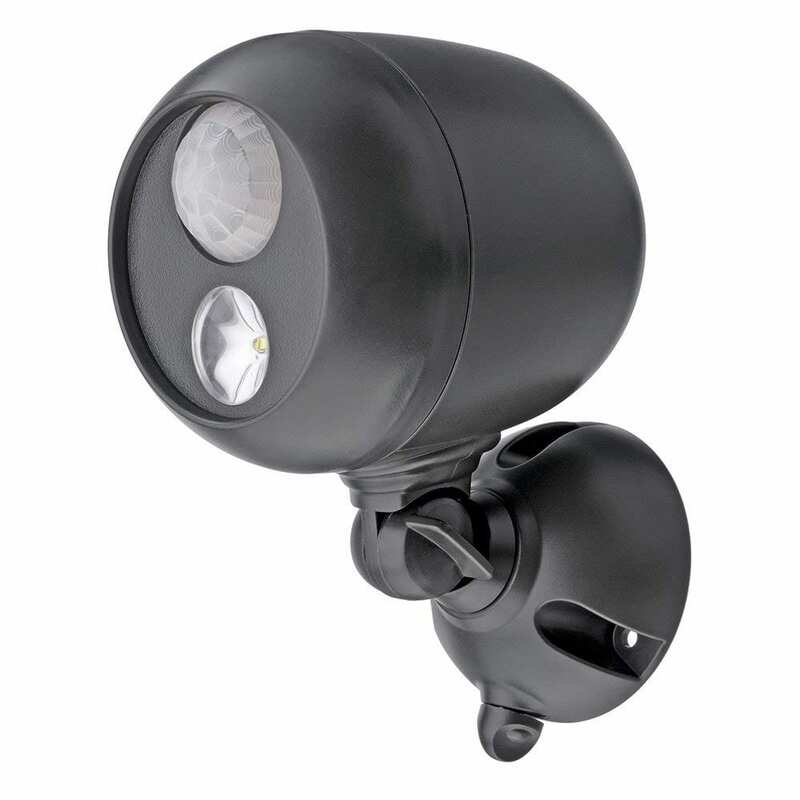 This durable motion detecting spotlight is so affordable you may want to buy multiple units for all your outdoor lighting needs. You can pick up one Mr Beams Spotlight for less than $20 or get a four-pack for around $60. Customers have installed this spotlight in less than five minutes. All it takes is a screwdriver and the included mounting hardware. And because it’s wireless, you can install Mr Beams anywhere—porches, decks, doorways, sheds, fences, garages, or trees. Thirty seconds after movement stops, the spotlight shuts off automatically. This convenient, built-in feature helps the batteries last longer. Mr. Beams claims one set of batteries can last up to one year. This spotlight can tell when the sun is out. That means it only turns on from dusk to dawn—another feature that saves battery life. The Mr Beams Spotlight claims to be waterproof, but customers have found corrosion inside the sensors due to moisture. It usually takes about a year for water to make an impact, but this is something to consider if you live in a moist climate. Some users report problems with the motion sensors being too sensitive. Unfortunately, this is a glitch you’ll have to live with because there’s no way for you to adjust the sensitivity if you’re getting too many triggers. Because these spotlights are so cheap, people tend to buy them in multiples. But there have been a lot of instances where some units in a multipack work perfectly and others are defective. We recommend testing every unit before installation so you can easily return a unit if you run into a problem. Litom boasts that more than one million families across the country rely on this solar light to provide security and safety. 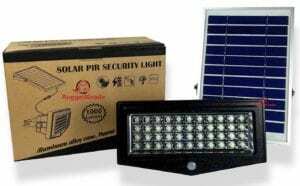 These lights can work from sundown to sunup when fully charged, which is exceptional for solar lights. As testament to Litom’s long illumination times, we saw several reviews from customers who have relied on these lights during the long-standing power outages in Puerto Rico. Best of all, you can pick up a four-pack for less than $60. 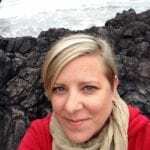 We were impressed with the large number of customer reviews praising Litom’s customer service. 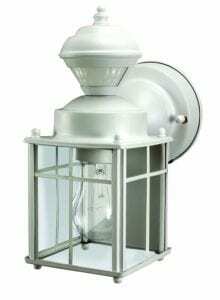 If a light arrives with a defect or stops working, customer service is responsive, fast, and ready to provide assistance or a replacement if needed. 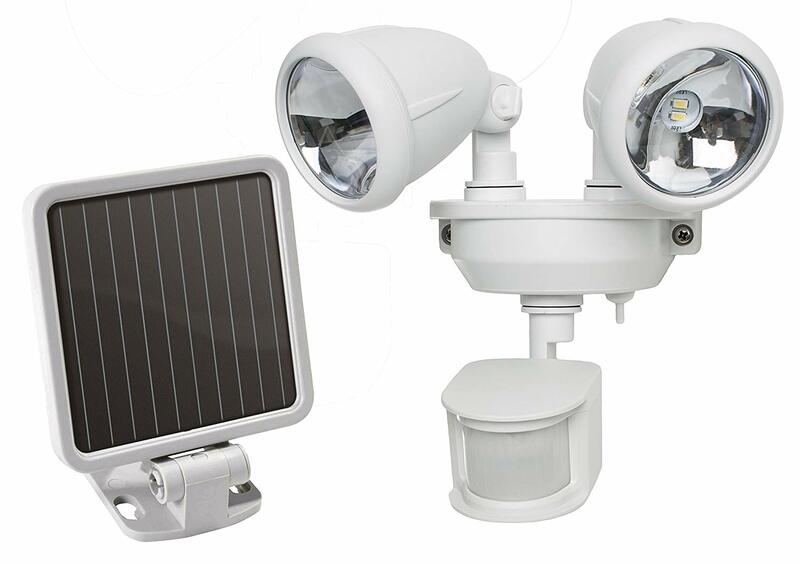 These outdoor solar lights have passed FCC certification, which means they might be the most reliable solar lights you can get. 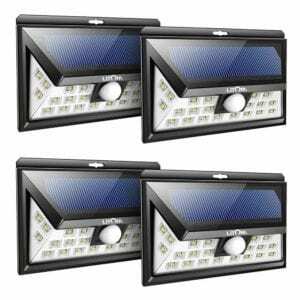 Litom Outdoor Motion Sensor Solar Lights are also highly rated by customers (4.6 stars on Amazon, with more than 1,400 reviews). You can adjust the motion sensor depending on ambient lighting. You can set the motion sensor to activate in dim light, medium light, or bright light according to your preferences and needs. 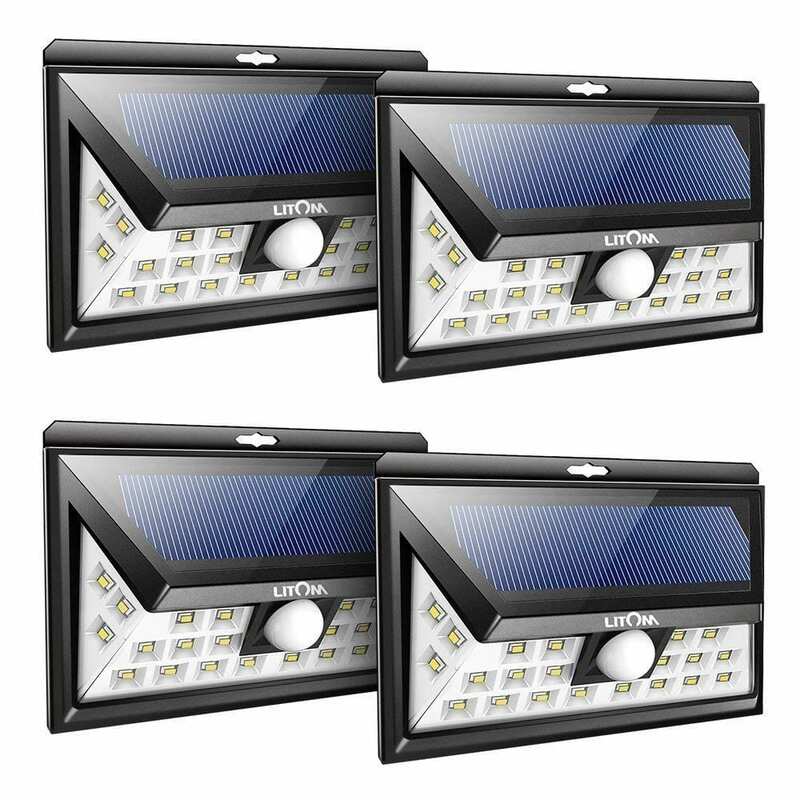 Litom’s wide-angle design provides maximum brightness to a broader area than most other outdoor solar lights. 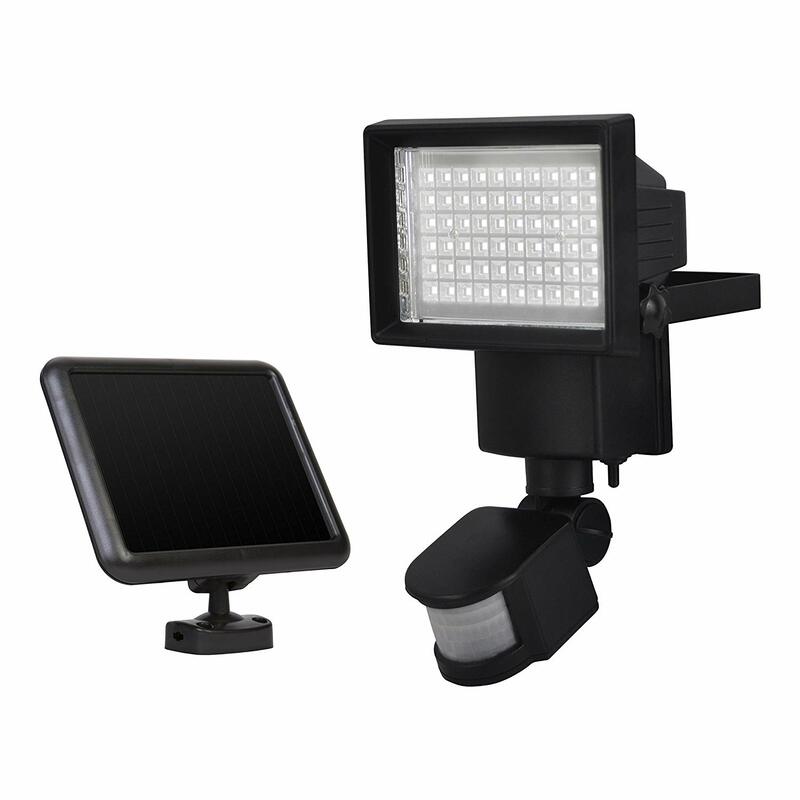 This light has a 270-degree range, which means Litom LED Outdoor Motion Sensor Solar Lights cover three times the area of many other solar lights. These lights are pretty small, so one light doesn’t cover a very large outdoor area. To protect an entire driveway or yard, you’d need to install multiple units. When the motion sensor is activated, the light only stays on for about twenty seconds. That can be too quick if you’re struggling with groceries from the car to the front door or trying to spot the kids that keep jumping your fence. There may be a reason these come in a four-pack. Each solar light is pretty small, so even though the light has a 270-degree illumination range, that range originates from a tiny device. 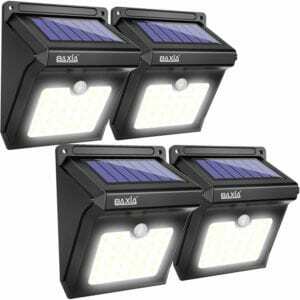 The solar powered MAXSA Security Spotlight is ideal for sheds, decks, garages, and walkways. It can detect motion up to forty feet away, and it comes with four super bright 0.5 watt LED lights that give off 160 lumens. With 1,000 lumens, the RuggedGrade Solar Flood Light easily scares away burglars and safely lights your way when you’re outside at night. Plus, it’s solar powered, so you don’t need to change batteries—just hook up the solar power cable and panel to keep this floodlight bright and ready for action. 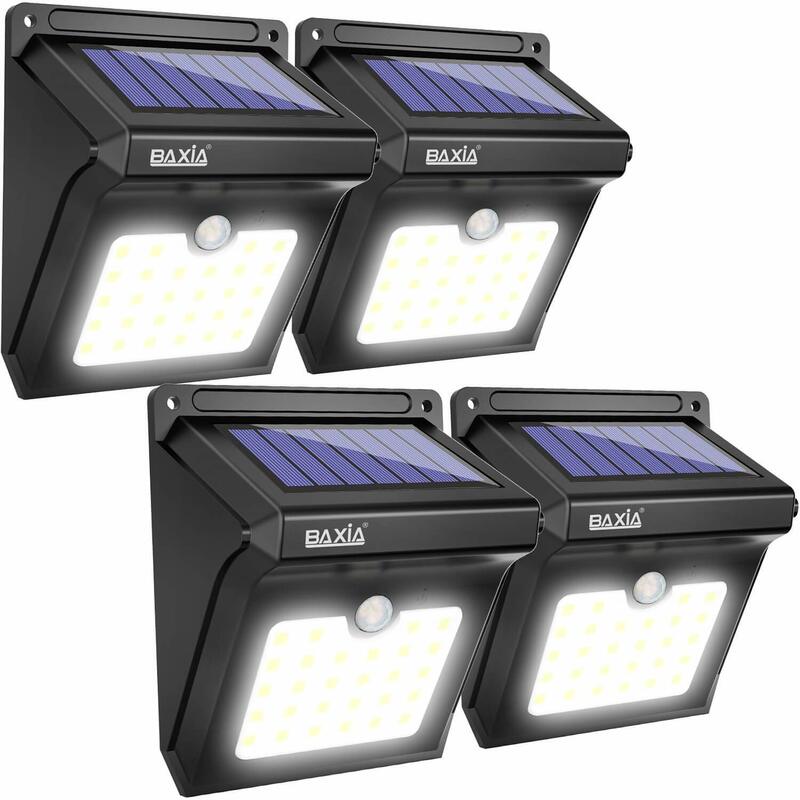 Baxia’s motion sensor lights have the highest weatherproof rating of any light on our list. These lights are water resistant and can withstand both extreme cold and extreme heat. Best of all, they come with a 30-day money-back guarantee. The Sunforce Solar Motion Light can be adjusted to your personal preferences. You can program what level of darkness activates the light, how long the light stays on once activated, its sensitivity to motion, and the range of motion detection. When you think of energy efficiency, solar lights probably jump to mind, but this hardwired motion light gives them a run for their money. The Leonlite Motion-Activated Security Light is eligible for state and national energy rebate programs, and it can save you up to 87.5% on your outdoor lighting electricity bill. If you want to startle an intruder without taking away from your home’s attractiveness, the Heathco Bayside Security Light is the answer. This stylish light comes in black or matte white finish, so it will complement your home’s aesthetics instead of detracting from them. The Hoont Wall Light lets you add motion-activated lighting to a wide variety of locations outside and inside your home. Light up pathways, hallways, closets, reading nooks, or the patio with this convenient, durable motion light. Why Do I Want Motion Sensor Lights? Motion sensor lights provide security, convenience, and energy efficiency. There may be one main reason you’re looking for motion-activated lighting, or you may want to take advantage of all the benefits. Your primary reason will help you figure out the answers to other questions, like what type of bulb to get. For security, you might want a motion floodlight that’s meant to surprise an intruder and scare them off. On the other hand, a motion light that makes sure you don’t get tripped up on your way into the house can be less powerful. What Type of Lightbulb Should I Get? Many outdoor lights use LED to help save on electricity and minimize the chance of fire from a traditional, incandescent bulb that gets hot while in use. The downside is that LED lights are often dimmer, which can be a deal breaker if you want to illuminate a big area or startle trespassers. Incandescent light bulbs use more energy and need to be replaced more often, but they tend to be much brighter. Because you’re looking for motion sensor lighting, you should have less worry about incandescent lights heating up from being left on too long. How Much Area Do I Want to Illuminate? The amount of coverage provided by a motion light is determined by the motion sensor range and the brightness of the light bulbs. If you’re looking to light up a small area like the front porch, you may only need a motion sensor with a range of a few feet. But if you want to illuminate a larger area like an entire backyard, you might want a floodlight with a range of 70 feet or more. You can also power up the reach of your motion light with bright bulbs that use more lumens. Small areas can get by with as little as 42 lumens, while floodlights can use up to 3,400. What Type of Power Source Is Best? 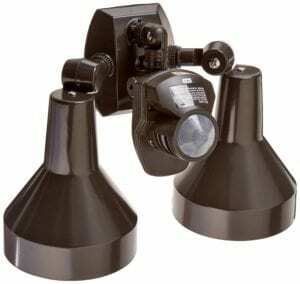 You can get motion sensor light fixtures that are hardwired, battery powered, or solar powered. The benefit of lights that use battery power or a solar panel is that you don’t have to install them near an electrical outlet. But solar panels need to be affixed where they’ll get enough sunlight for a full charge. The drawbacks with battery and solar power are that your security can be compromised due to a dead battery or a cloudy day. You also sacrifice brightness with those power sources, as the brightest lights tend to use hardwiring. If you do go with hardwired motion lights, be sure to plan ahead in case you need to run wires through walls or secure extension cords. Can I Add Motion Sensor Lights to My Security System? You should be able to add motion sensor lights to an existing home security system. Contact your security provider to find out if motion sensor lights are available. If the company you use doesn’t offer motion lights, find out if the system is compatible with any third-party motion sensor lights. The benefit of having motion lights integrated into your security system is the convenience of mobile alerts when the lights are activated. Plus, if you have security cameras, the lights can help you get better footage in low-light situations. There are many situations where a motion-sensing light can come in handy, whether it’s as a nightlight or a convenient way to see what’s in the back of the closet. These gadgets let you decide where and how you want motion-activated light—both outdoors and inside your home. What are pet-immune motion detectors and how do they work? We delved into industry research and reviews from real users to evaluate product performance, features, and specs. We also explored the FCC rules for LED lighting and consulted expert reviews to help us determine the best motion sensor lights of 2018. We picked our top ten after looking at more than fifteen products that were compared for effectiveness, reliability, customer satisfaction, and affordability.